The path to the first week of BCS-quantified football is an arduous one, one pock-marked with mediocre match-ups and lopsided scores. Sure, an LSU-Florida can get sprinkled in here and there, and the first couple of weeks offer up a few other compelling games, but for the most part, the schedules of the FBS Big Shots are littered with Tennessee Tech’s and Portland State’s. Nothing against Tennessee Tech or Portland State, by the way, the game’s just different amongst BCS contenders. But all that’s over with. The faultiest, most fraudulent analytics poll this side of FOX News has been un-caged, let the carnage begin. And the first victim of college football’s version of HAL 9000 was none other than the this year’s Quacktastic Ducks. Oregon has somehow, since holding steady at #2 in both polls after LSU incurred a vicious belly wound in The Swamp, been leapfrogged by Florida in the introductory standings. The worst part of the slight might very well be that there is no slight, at least not one in the traditional human sense. Oregon is a unanimous No. 2 in the AP Poll, the USA Today Coaches Poll and the Harris Poll. 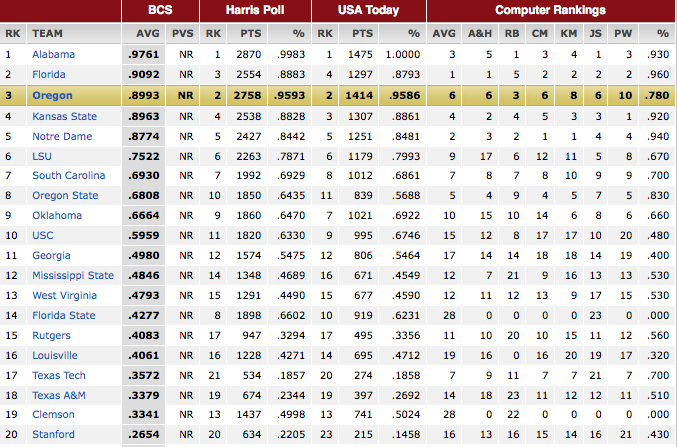 The last two figure into the BCS ranking. But this is the beauty of the BCS: If it’s counter-intuitive, it’s probably right on. So while Oregon is viewed as the nation’s second best team by nearly every pulse-possessing member of the media, coaching community and alumni establishment, the computers have Oregon — get this — 6th in the polls. That’s right, Oregon, even armed with two Top 25 wins, a scoring average north of 50, an average margin of victory that would make Xerxes, former emperor of Persia, blush and a nasty little Total-Annihilation-Attitude, is viewed by the computers as a worse team than Kansas State, Notre Dame and Oregon State. If it weren’t for the impact of humans on the system, this column would have been written in all caps. But seriously, emotionless BCS computer? K-State, Notre Dame, Oregon State and Florida? I could handle Florida. Maybe. But Kansas State eked out a seven-point win over Iowa State this week. Impressive, if you’re either from Manhattanville or wowed by the dialogue on General Hospital. Plus, if the Big 12 looked like more than a two-and-a-half-team conference I might take the ‘Clones seriously, but it doesn’t, so I won’t (and yes, I counted West Virginia as a half of a team because they are). Notre Dame has won over some good teams the last four weeks, but it isn’t like they are doing it at a 32-point clip like Oregon is, and those three Top 20 opponents have had a track record that has been spotty at best1. How are we supposed to trust a computer that has decided that Notre Dame (a 13-6 winner over Michigan) is better than Alabama (a 41-14 winner over the same Michigan team and an average computer ranking of 3)? I’m serious. Oregon State has been a wonderful story. Mike Reilly has the steadiest job in college sports, backup QB Cody Vaz stepped in brilliantly for an injured Sean Mannion this week against BYU and they’ve beaten two Top-20 teams. But their body of work stands up to Oregon’s like a trailer park stands up to a hurricane. OSU’s marquee victories? A 10-7 grinder over then-No. 13 Wisconsin and a shocker in LA against then-No. 18 UCLA. Wisconsin isn’t the Wisconsin that the preseason polls thought they’d be, but the win over the Bruins was a good win. I still have trouble with the notion that the computers consider a body of work that includes a 19-7 win over Washington State to be more substantial than Oregon’s. Florida is a slightly different story. I’m still under the impression that the SEC is going to play themselves out of contention, save the King of the Hill, in a similar fashion to what happens in the Big East in college basketball year after year. Florida’s big win over LSU is much better than anything Oregon has on its updated 2012 resume, but Oregon has time. The troubling thing about the first poll is this: The computers clearly favor Notre Dame’s and Kansas State’s performance, and their schedules don’t exactly soften up. K-State faces four ranked opponents in the final six weeks, and Notre Dame still has USC and Oklahoma to play. If either team runs the table, the computers might take it out on Oregon. Oregon needs Oregon State, Stanford and USC to all remain as competitive as possible, but that is a tall order in the dog-eat-dog world of conference play. Welcome to BCS Season, folks. Hope you’re ready for the chaos. Since losing to Notre Dame, Michigan State has nearly lost to an Indiana team that last was relevant in the Dubya Era, and did lose to Iowa, a team that undoubtedly wins the award for “Strangest Collection of Offseason Hiccups,” if they ever decide to hand that one out. And Michigan? Michigan has its act together against bad teams, but against quality opposition? Yech. Jump. Bob: They are 7th in total offense, 112th in total defense. Half of a team.